Traditional and new forms of advertising have recently gone head to head in a contradictory way - as if they are mutually exclusive. Even those advertisers who use a media mix still have strong beliefs about one medium that works the best, and they allocate more money toward that specific channel. However, we are here to bust the myth that traditional and new forms of advertising don’t complement one another. In fact, if you want to maximize your advertising budget, you should supplement your traditional media campaign with an interactive mobile strategy. 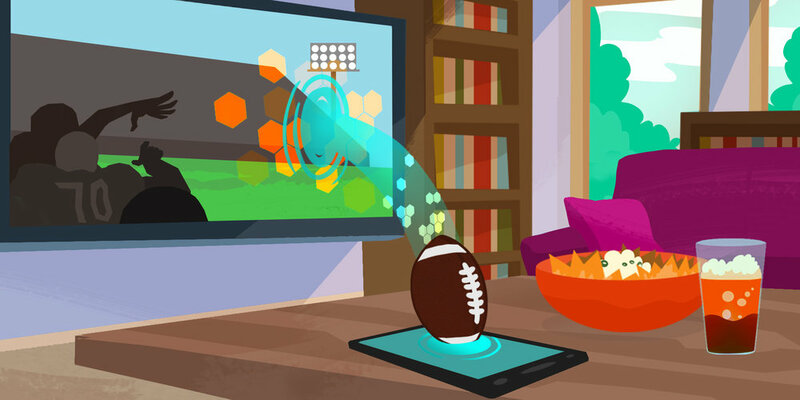 A comprehensive use of both traditional and new forms of media can help you achieve the “Super Bowl Effect,” ensure you can track your brand awareness and engagement, and have a plan to counteract people who don’t watch your broadcast ads. The Halo Effect is advertising terminology that refers to a company or product using associations and cognitive biases to influence how people feel about their brand. Basically you are capitalizing on psychology, feelings, and human bias for the benefit of your brand. One of the key examples is celebrity endorsements in your Super Bowl commercials. You may have a dazzling celebrity flash their pearly whites and draw audiences in with their glimmering green eyes to shape how consumers perceive your product and add value to your brand. Almost magically, your product becomes something consumers need. The desired effects of the Halo Effect can be widespread. Consumers think your company makes better decisions, cares more about them, or is more future-oriented. But, before you bank on our most beloved swimmer, bodybuilder or movie star to build your brand, it is worth thinking about how else you can support your strategy to ensure a comprehensive advertising approach. We term this the “Super Bowl Effect.” This is where interactive mobile ads make their grand entrance into your advertising strategy. With the potential to spend millions of dollars on one television commercial spot, you had better believe your commercial will work favorably for your brand. However, because brand awareness is considered a “fluffy” topic (as consumer feelings are involved), it is not easily trackable. In order to maximize your brand awareness and budget, your brand dollars should include a well developed mobile strategy. With your mobile strategy, you can plan exactly how and when your potential users engage with your content - something never offered by a broadcast message. Not only can you see if the user is engaging with one interaction, but you can track their journey the entire way through your interactive ad. Even an interactive strategy on mobile will outperform interstitial ads or video ads because they do more to engage your audience which means tracking their every move is even easier. You know what resonates with your audience - unlike the limited direct feedback or conversions from broadcast television. For example, if someone were to close out of your ad after the second interaction point, you would know there is something you should be doing to better engage your audience and you know exactly what in your ad that they saw or didn’t see. What if you spend 5 million dollars on a television ad and half your viewers are busy eating chips and salsa. Even worse, every advertiser’s nightmare is that viewers have actually left the room! Millions of dollars down the drain because no one even sees your ad. You can hire hundreds of celebrities to flash their pearly whites or the most adorable puppy in the world, but even this can’t win in the battle for attention when competing against the scramble to the bathroom during game day ads. First, a user who watches your television ad and sees your supplemental interactive ad has the opportunity to notice your customized smaller details that reinforce your message. Let’s say, for example, you are a fast food chain well-known for your $2.99 enormously-sized steak sandwiches. You could create a playable game where the user catches as many sandwiches in his mouth as possible or a build your own sandwich quiz. Since you have emphasized to potential customers about your unique menu item, they will be more likely to visit your restaurant.This type of experience is impossible in simply a television commercial. Second, if the user leaves the room during your television commercial, a mobile ad is another chance to reach him or her. People can interact with your mobile ad and, in turn, be inspired to actively search out your television commercial, after the game. Even better, the ad alone could convince them to take an action or become a buzzworthy point of conversation. With user-acquisition costs hitting record high numbers, you want to make the most of each prospective user. Contrary to popular belief, broadcast and new forms of digital advertising create a cohesive strategy and keep user-acquisition costs low as you target your user and reinforce your message from a number of angles. This robust ad strategy utilizing traditional and new forms of advertising can help you reach any number of goals. You can use geo-targeting so people can find your company’s location that is closest to them, increase your brand awareness, increase knowledge about specific items, drive sign ups for a special promotion, or drive app downloads. Combine traditional and new forms of advertising to create a power couple that increases and tracks brand awareness.